Soak dhal in water for an hour. Chop green chillies, ginger and curry leaves. Grind the soaked dhal in a grinder to a smooth paste using very little water. The batter when dropped in water should float and that is the consistency. When smooth and slightly frothy, add salt, and also the chopped items, and grind again for two more minutes. Take out the batter and add pepper. Mix well. Heat oil . Meanwhile, wet your palms with water, take out a ball from the batter and flatten it using your hand and put a hole in the centre. (OR) can use a plastic cover (OR) banana leaf. Carefully drop them into the oil and turn it on both sides and cook till golden brown. Make a batch of vadai. Repeat the process for each batch. Coarsely powder a spoon of jeera and 1/4 spoon of pepper. Puree a tomato. Soak half the lemon size of tamarind in 1/2 cup of water and extract juice from it. In a deep vessel, add pureed tomato, tamarind extract, salt to taste, and hing. When it boils, add 1 tablespoon of rasam powder. Allow it to boil till the raw smell is diffused. Now add 3 1/2 cups of water. When it starts boiling and frothy, switch off the stove. Heat a spoon of ghee, add mustard seeds and pepper-jeera powder. Put it on the rasam. Garnish with coriander leaves. Keep it hot and ready. HOW TO SERVE: Take half the quantity of rasam in a wide bowl. Keep it ready. When a batch of vadais are done, drain from oil and drop them in the rasam. Allow it to get soaked for 5 minutes. Drain and transfer to another vessel. Meanwhile make the next batch of vadais and repeat the process with all the batter. Transfer 2 vadais to a serving dish. Pour the required quantity of rasam, Garnish with some chopped tomatoes and coriander leaves. Serve piping hot. I try always to keep rasam on days I make urad dhal vada. Having the vadai soaked in rasam is one thing and drinking up the rasam afterwards is yet another thing of sheer indulgence. i am making this rasam sans dhal just for the sake of drinking it up! rasam vadai romba romba tempting and inviting. We too in our family love rasa vadai a lot. Vada looks tempting and inviting...looks delicious. Slurp, irresistible rasa vadai,makes me drool. 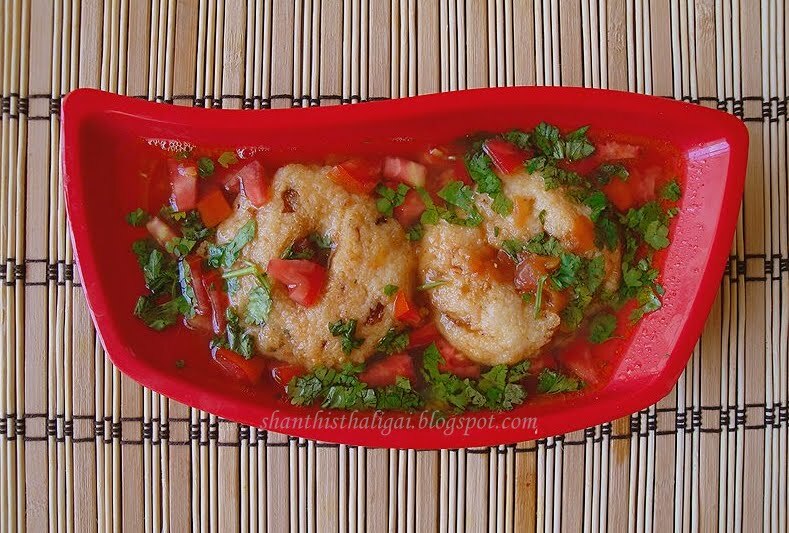 When I think of the rasa vadais soaked in hot rasam,I start drooling. If you add a few drops of ghee to the mix will it turn out to be ambrosia? Yummy and delicious one !!!!! WOW this rasa vada looks mouthwatering!!! Yummilicious rasa vada..Just love it!! firs time here. do visit my space too.